The Maine Senate approved an amended bill that would extend health insurance to more than 60,000 Mainers through MaineCare. AUGUSTA — The Senate’s approval Thursday of an amended bill to expand Medicaid through the federal health care law could reinvigorate efforts to broaden the public health insurance program for the poor. The Senate voted 23–12 for the amended version of L.D. 1066, a proposal that supporters say would extend health insurance to more than 60,000 Mainers through MaineCare, the state’s Medicaid program. Coverage would be available to adults without children who earn as much as $20,500 a year. Unless the Legislature takes additional action, however, eligibility would expire after three years, when federal reimbursements for the program are scheduled to decline from 100 percent to 90 percent. That “sunset” provision, together with language requiring an audit of the broader financial effects of the expansion, are part of an amendment intended to ease Republicans’ concerns about the expansion’s effect on state spending. Three Republicans and one independent voted with the Democratic majority Thursday to support the amended bill. The Republican support is critical to the bill and could change the debate on expansion, a key component of the Affordable Care Act. The federal law has become a hyperpartisan issue in states that are considering whether to broaden their Medicaid programs. 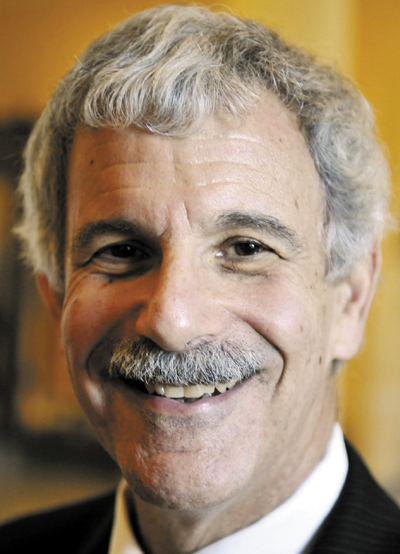 Roger Katz, R-Augusta, the assistant Senate minority leader, was a key figure in the bipartisan vote. His amendment was ultimately approved by the Democratic majority. Katz said the amendment is designed to bridge the gap between those who are sure that expansion is the right thing to do and those who oppose it. Katz, who split with the majority of his caucus, said it was the most difficult decision he has made as a state senator. Senate Majority Leader Seth Goodall, D-Richmond, said the bill isn’t everything Democrats want but it’s the best bipartisan compromise. “We can’t be siloed in one political belief or another,” he said. Katz met with House Speaker Mark Eves, D-North Berwick, on Wednesday. A spokeswoman for Eves would not confirm that Katz was there to discuss the amendment, but Eves has made Medicaid expansion his primary policy initiative this session. Katz offered his amendment Thursday. It’s designed to ease Republicans’ concerns about expanding MaineCare, which has been at the center of multiple budget shortfalls over the past several years. Republicans have said it’s reckless to expand the program without first making sure that the state addresses its current problems. Katz’s amendment seeks to ensure that Maine receives the promised 100 percent federal reimbursement for childless adults who enroll in the program in the first three years of expansion, as prescribed in the Affordable Care Act. The federal government now pays 62 percent to cover about 10,500 Maine adults without children. It probably would increase reimbursement to 100 percent from 2014 to 2016 before gradually dropping to 90 percent, according to a letter from the Centers for Medicare and Medicaid Services. Maine already provides Medicaid to about 15,000 nondisabled parents, as defined in the federal health care law. According to the Centers for Medicare and Medicaid Services, the state would continue to receive its current reimbursement of 62 percent. Expansion isn’t expected to add parents, but it would prevent the 15,000 parents from losing coverage on Jan. 1 because of changes the Legislature enacted last year. The amendment also includes “a hard sunset” to end health care coverage for the expansion population after the 100 percent federal reimbursement ends in 2016. Continuation of the expansion would need the Legislature’s approval when the reimbursement falls to 90 percent. Sen. Doug Thomas, R-Ripley, said the sunset makes a “bad bill worse.” He said lawmakers couldn’t eliminate health care coverage for people once they had provided it. Katz’s amendment also would direct the Legislature’s nonpartisan fiscal agency to hire an auditor to evaluate the expansion’s effect on overall cost, utilization and hospitals. Supporters of expansion have argued that it would save the state money while reducing hospitals’ charity care. The LePage administration has challenged those claims. The review would be used by lawmakers to determine whether to continue Medicaid expansion after the first three years. Katz’s amendment seeks a guarantee from the federal government that Maine would get the 100 percent, three-year reimbursement like other states. Katz’s amendment drew ctiticism from several Republicans, including Sen. Mike Thibodeau, R-Winterport, who said expanding Medicaid is reckless. Democrats were hopeful Thursday that the Senate vote would create momentum in the House. The House gave preliminary approval to the bill Monday. Five Republicans voted with the Democratic majority, but the margin isn’t enough to override an anticipated veto by LePage. Rep. Matt Pouliot, R-Augusta, didn’t vote with the five House Republicans who supported the expansion bill Monday, but said he is keeping an open mind. Pouliot said a sunset provision would alleviate some of his concerns.